With the 2012 European Championships now well under way many will be focusing their attention to a number of certain players who are likely to attract the interest of many of the top European clubs this summer. Top performances would only help to further increase the level of respect garnered by some European stars and many coaches will hope that if they are to lose any key players their form in this tournament can at least inflate some players values. Arsenal manager Arsène Wenger has spoken of his fear to sign players based on performances in an international tournament as it is not a given that they would be able to repeat the form of a couple of weeks over an entire season. Here are some notable instances in which form has not been repeated by players following transfers on the back of a successful Euro’s campaign. Roman Pavlyuchenko played a key role in Russia’s Euro 2008 campaign, scoring 3 goals in 5 appearances as the side made it to the semi-finals only to be disposed of by eventual champions Spain. Pavlyuchenko was soon named in the 23-man Team of the Tournament alongside forwards Fernando Torres, David Villa and fellow countryman Andrey Arshavin. Following such a successful time at the tournament the Russian soon moved on from Spartak Moscow with 69 goals in 141 games and signed for Harry Redknapp’s Tottenham Hotspur for a fee of £14 million, a steep figure that he would have to live up to as well as the task of filling the void left by the outgoing Bulgarian Dimitar Berbatov but following such impressive performances that summer this did not seem to pose much of a challenge. Despite some impressive goals, as the seasons passed it became clear that it would not get easier for the Russian to break through with the likes of Rafael Van Der Vaart and Emmanuel Adebayor coming to White Hart Lane. In the 2011-12 January transfer window a disappointing time at the North London club was put to an end as Russian side Lokomotiv Moscow came in willing to stump up £8 million to take Pavlyuchenko back to his homeland. In 2004 Greece stunned Europe and the world going on to win the European Championship beating hosts Portugal 1-0 in the final, defensive midfielder and captain Theodoros Zagorakis was a major part of this success. Greece received plaudits for great defensive performances and Zagorakis was central to the astute organisation of the Greek side that conceded just four goals throughout the competition. Zagorakis was awarded for his performances being named the player of the tournament by UEFA. Going into the tournament Zagorakis was with Greek side AEK Athens although soon found his way making the move to Italy with Serie A side Bologna following an impressive summer with his international side. The anchor man was bought for £1.5 million although the side that had purchased the player considered one of Europe’s top footballers at the time found themselves embroiled in a relegation battle and were confined to Serie B losing 2-1 on aggregate to Parma in the Relegation Play-off. Following the relegation Bologna were forced to release the Greek due to the inability to afford his wages, he returned to Greece joining PAOK living out the remainder of his career with the club. Although, whilst Bologna were relegated in Zagorakis’ first and only season, defensively they were impressive and conceded just 36 goals, the fourth lowest amount in the league. It did appear the main issue for the club was scoring goals and whilst Zagorakis could do much to help organise the team at the back, he was not of as much use going forward with just 35 goals in his entire career. 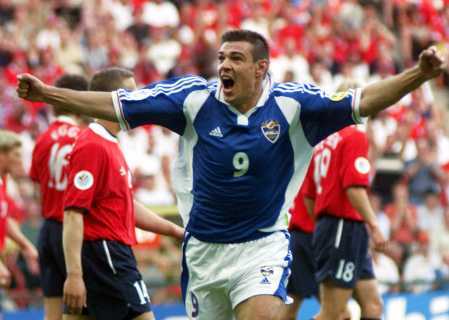 Serbian Savo Milošević had an impressive Euro 2000 finishing alongside Patrick Kluivert in the scoring charts with five goals despite playing less games than the Dutchman. Milošević was named in the UEFA Team of the Tournament and the Zaragoza centre forward soon moved to Serie A side Parma for £22 million as a replacement for Argentinian Hernan Crespo. In 4 years at the Italian club Milošević managed just 31 league appearances scoring 9 goals and was never able to find a starting spot in the side. After two years of being used very much as a bit part player Milošević made a number of loan moves back to Spain. Whilst on loan two out of the three sides he played for ended up being relegated, and in this turbulent period he managed just 32 league goals in 87 appearances, a poor return for a striker of such talent. In 2004, Milošević’s Italian job was finally put to a permanent end and he was sold to Spanish side Osasuna having achieved little if not next to nothing after his big money move. In his first senior role at Partizan in 1992, Milošević impressed many scoring 74 times in 98 games with a goals per game percentage of 0.75%. Although a move to Aston Villa drew three disappointing seasons and despite re-finding goalscoring form with Zaragoza and with the national side at Euro 2000 the Serb always found consistency throughout his career hard to come by. 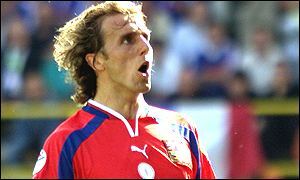 At Euro 96′, Czech winger Karel Poborský very much shot to shame not only for his top performances but for a certain lob over Portuguese keeper Vítor Baía which came to be known as the infamous ‘Poborský-lob’. Poborský’s performances had managed to catch the attention of Manchester United’s Alex Ferguson, the Czech signed for the English champions in July 1996 for £3.5 million, this was the players first time playing for a club outside of his native Czechoslovakia. Whilst with United, Poborský found it hard to find a regular spot in the team and despite some good showings (most notably in a 4-0 victory over rivals Leeds United) the task of challenging the rising star David Beckham was not easy and it was a task the Czech ultimately failed. After a season and half and just five league goals in 32 games Poborský left Manchester joining Portuguese outfit Benfica. Although Fergie clearly did not learn his lesson, as shown by the signing of Kléberson on the back of a successful World Cup campaign in 2002. In 2008, Portuguese full-back José Bosingwa put in some top performances in the Euros which earned him many plaudits as well as a place in the Team of the Tournament. The Porto player then followed Portugal’s Head Coach Luiz Felipe Scolari to Chelsea for £16 million and many fans could had been forgiven for getting excited about having a player on the back of such a successful summer. Throughout his time with the London club Bosingwa has been noted for his speed and willingness to get forward as many modern full-backs are expected to do, however defensively Bosingwa had always been very suspect. After cementing himself as the first choice right back in his first season, a knee injury which ruled the full back out for the majority of the 2009-10 season paved the way for a year of top performances by Serbian Branislav Ivanovic. Ever since, Bosingwa never did manage to regain his place as a first team regular and some performances for the Blues certainly did not warrant one. Four years down the line from the Euros and despite having received a Champions League winners medal Bosingwa is now tasked with finding a new club after being released by Chelsea, who made the decision not to take up the option of an additional one-year extension on the defenders contract. This calls an end to what has been a largely disappointing time with the West-London club and whilst he can leave the club on a high, overall Bosingwa never really lived up to the high fee paid for him as well as his billing following his performances at Euro 2008. In the year 2000 this French goalkeeper was already a World Cup winner and had earned many plaudits as one of the world’s best goalkeepers. Unlike many of the other ‘flops’ Fabien Barthez was already an established star in Europe, although it was following his performances at Euro 2000 that Sir Alex Ferguson snapped up the Frenchman to finally replace the influential Peter Schmeichel. In his first season at the club Barthez endeared himself to many fans with his eccentric and at times unorthodox style. His second season however was a different affair that had started badly following a number of high profile errors. His antics were proving risky and as seasons past it became clear that United were risking conceding unnecessary goals at the hands of their keeper. Ferguson eventually lost patience with Barthez dropping him for the ever reliable Roy Carroll towards the end of the 2002-03 season before finding a seemingly sufficient replacement in American Tim Howard. After a loan period at former club Marseille, after the 2003-04 season Barthez was released from his contract with United. A disappointing end for a keeper who had shown so much promise. And so who will be next to join the list of European Championship transfer ‘flops’? With so many examples throughout history not only following the Euros but the World Cup also it can be hoped that manager’s wont be making those same mistakes this summer. Although can you really blame somebody for signing a player who exhibits skill like Poborský in 96′ or hits sweet goalscoring form like Pavlyuchenko in 08′ and Milošević in 2000? No, you cannot. However, there is no doubt that like always the media and fans will applaud a signing of the summers hot property before lambasting the decision if it does not work out. All you can really hope for is that it is not your club falling into the trap posed by players in Poland and Ukraine this summer.